Mathis’s family moved to San Francisco when he was a boy. His father, a vaudeville performer, spotted his young son’s talent and encouraged his singing. Also a star athlete, Mathis excelled in high jump and basketball. In 1954 he enrolled at San Francisco State University on an athletic scholarship. As a teenager, Mathis caught the attention of a club owner who offered to become his manager. After she invited a talent agent from Columbia Records to see him perform, the company signed him. Despite a recording deal, Mathis was torn between music and sports. The U.S. Olympic Team invited him to try out at the same time he secured the contract with Columbia. 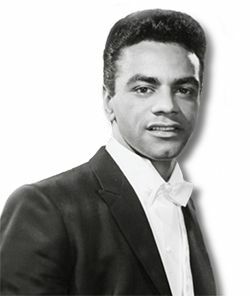 On his father’s advice, Mathis recorded his first album, “Johnny Mathis: A New Sound in Popular Song” in 1956. He recorded two of his most famous songs, “Wonderful! Wonderful!” and “It’s Not For Me to Say,” that same year. By the end of the 1960s, he had released a greatest hits album, which spent an unprecedented 461 consecutive weeks on the Billboard charts. Mathis struggled with drugs and alcohol. He was candid about his addiction and rehabilitation. He was reluctant, however, to discuss his sexuality. In 1982 he told US magazine, “Homosexuality is a way of life that I’ve grown accustomed to.” He received death threats over of the comment. Mathis’s music has been featured in movie soundtracks and in more than a hundred television series. His 1978 song “The Last Time I Felt Like This” was nominated for an Academy Award. He has appeared in films and more than 300 times on TV, including in his own specials. In 2003 the Academy of Recording Arts and Sciences honored Mathis with its Lifetime Achievement Award. He was inducted into the Grammy Hall of Fame and into the Great American Songbook Hall of Fame.